Audition information for the UofSC School of Music can be found here. If you are a bassoon student or fellow teacher, please don't hesitate to contact me directly with questions or comments (see the "contact" link above). Some specifics about my own teaching and the UofSC bassoon studio and School of Music follow; you can also visit the bassoon studio on Facebook. 1) Help all of my students work to reach their full potential as bassoonists, musicians, teachers, and people. 2) Nurture musicians that are kind, hard-working, curious, and open-minded, with a passionate love of music and willingness to explore all musical styles. 3) Inspire musicians that are socially engaged, community-minded advocates for their art, dedicated to the idea that music -- what we do -- is truly important, and while we love that music can take us around the world, the most significant place to make a difference is always "right here." The 2018-19 University of South Carolina Bassoon Studio, following our “ugly sweater” holiday concert. Bassoon study at USC is technically rigorous. 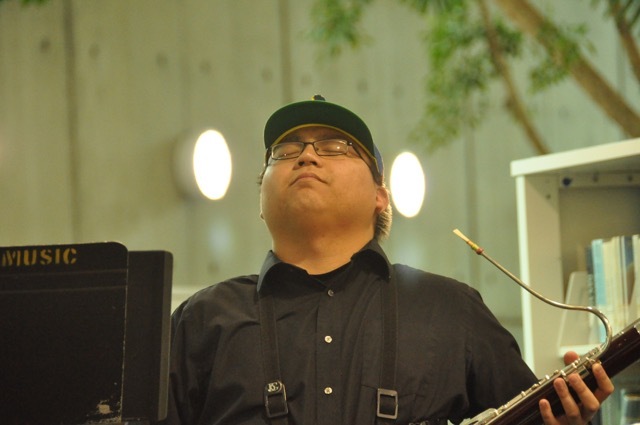 I believe in a structured, step-by-step approach to acquiring bassoon technique, determined initially by each student's individual strengths and weaknesses. Scales, scale exercises, and long tones: yes. Etudes that build endurance and specific skills: yes. Journaling to keep practice more organized, reflect, and set goals: yes. Targeted exercises for tone development, intonation, vibrato, phrasing, tonguing and articulation, etc...: yes, yes, yes. 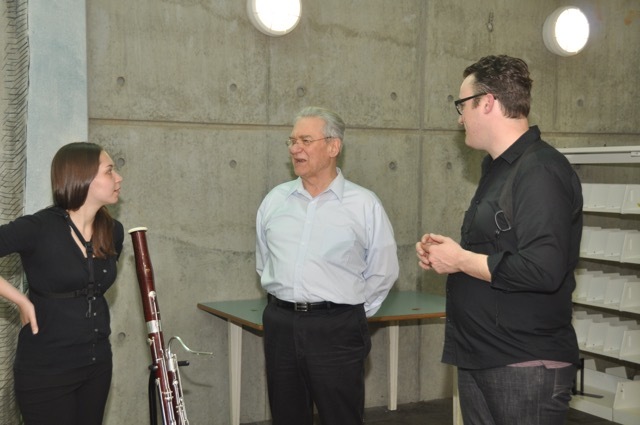 Above all, a singing, vocal approach to the bassoon is important to me and informs my teaching. Reed-making is a vital part of playing the bassoon. In weekly reed classes and private lessons every UofSC bassoon student learns to make reeds tailored to their own needs. Of course, applied lessons, individual practice, and reed-making would be lonely enterprises without the support of a community. Weekly studio classes and activities attended by all bassoonists engaged in private study are one way we come together as bassoonists, and the heart of what makes the USC bassoon studio special. We play together and for each other, work on special projects (more on this below), host renowned guest artists, and read and discuss "studio books" each year. 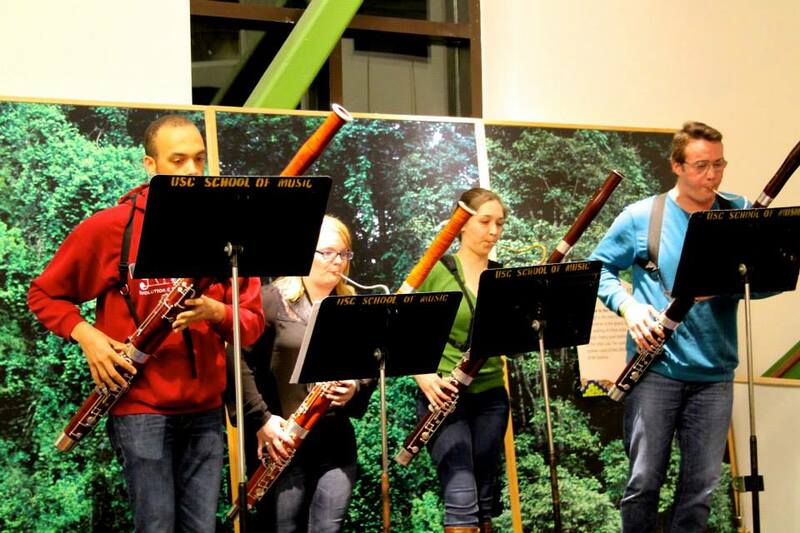 The bassoon studio is a sub-group of a two larger communities, the Double Reed Studios (we partner frequently in events and concerts with our oboe-playing friends) and the USC School of Music. The School of Music, one of the Southeast's leading music schools, has become a national catalyst for the discussion of the changing role of musicians in the 21st century, thanks to our world-class faculty and pioneering organizations such as Spark: Carolina's Music Leadership Laboratory. The SoM also functions as a small, nurturing college with about 550 undergraduate and graduate students (we all know each other, and class sizes are small!) amidst the backdrop of the larger Research One university that is UofSC. All of a student's classes and applied studies at UofSC -- the "Carolina core" of our general education classes, music theory and ear training, music history and music entrepreneurship, conducting and composition, our superb, nationally acclaimed ensembles, and the multitude of chamber music opportunities that await our students -- work together to create well-rounded musicians, scholars, artist-teachers, and (ultimately) more compassionate people. This is about much more than "career preparation." As a former English lit major and graduate of a small liberal arts school, I believe passionately in the humanities, and that college is a place to learn about BIG ideas and grow closer to our true and better selves: to speculate about the shared human condition, to appreciate the value of great art, literature, and philosophy, and to collide with ideas that are new and perhaps earth-shaking. This process is not always easy, and takes both an open mind and a lot of hard work. In the words of the Romantic poet John Keats, it is partly through facing challenges that the world (a microcosm of which is the true University experience) becomes a "vale of soul-making" -- "soul" here meaning our earthly being. In an 1819 letter to his brother and sister, Keats wrote, "Do you not see how necessary a World of Pains and troubles is to school an Intelligence and make it a Soul?" Music is a highly competitive field, and it's not easy to become really good at anything. Students that carve out meaningful careers in music are those that work the hardest, maintain a positive attitude along the way, and take full advantage of the many opportunities UofSC has to offer. Of course, when the payoff is a meaningful career doing what you love and a broadened view of the world, all of the work is well worth it. 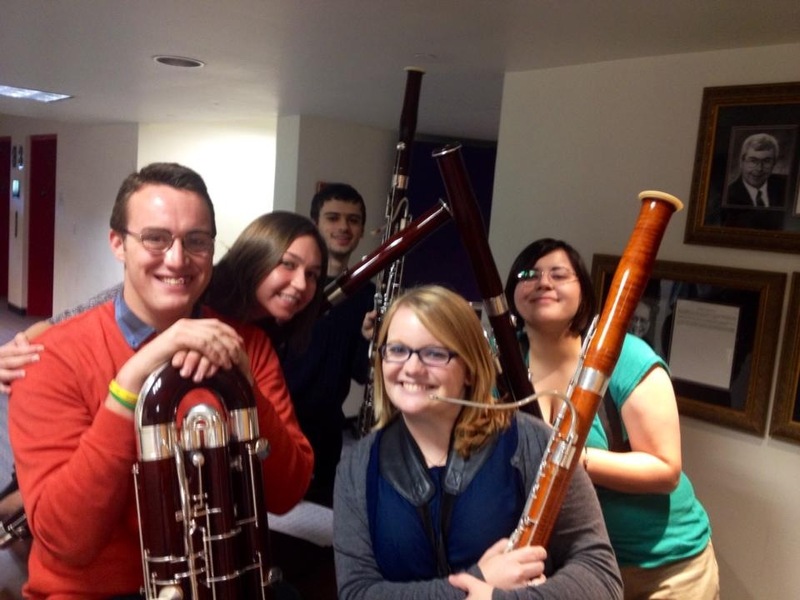 And as a bassoon studio, we have fun working -- and playing -- together! Bassoon study at UofSC is musically omnivorous and engaging. In private study and in weekly classes with the entire bassoon studio, students study, listen to, and perform works of a wide variety of musical styles, places, and time periods, from works steeped in the classical tradition to pieces influenced by world music or jazz; from the earliest Baroque works for bassoon (or transcriptions of even earlier music) to 21st-century music by composers that are alive and kicking; from traditional sounds to the avant-garde. 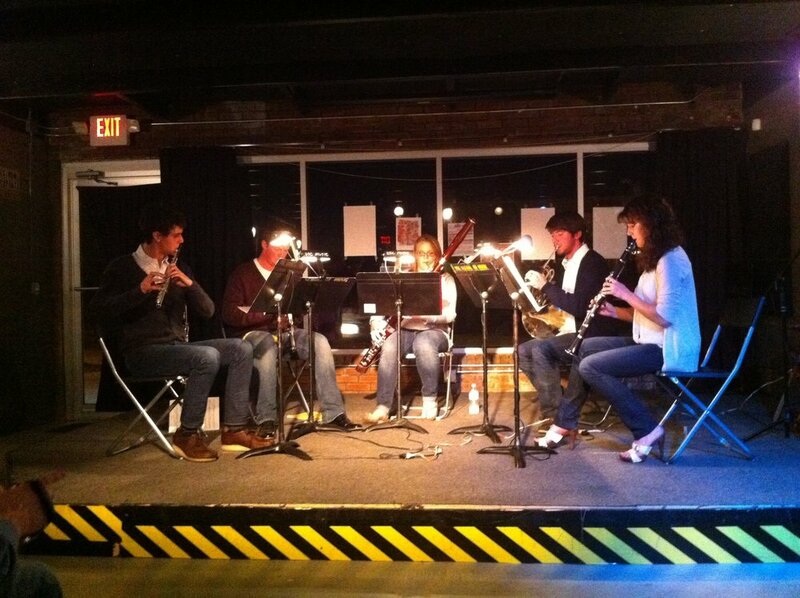 In the contemporary music arena, bassoonists play important roles in regular New Voices concerts -- performing works by their peers, USC composition majors -- and the ever-creative, student-run new music organization CICA (Collaborations in Contemporary Art). Students are not required to love every musical style and tradition ... but they are required to give numerous styles a chance, and hopefully learn what makes each unique and appealing. Part of remaining open-minded, curious, and current includes welcoming as many performers to campus as possible and learning all we can from them. Fortunately, there are an abundance of opportunities to work with and hear some of the world's greatest artists at UofSC. In April 2018 we hosted composers Valerie Coleman and Jeff Scott, who gave masterclasses and heard the premiere of their new works celebrating the legacy of Richard Greener, USC's first African American professor. 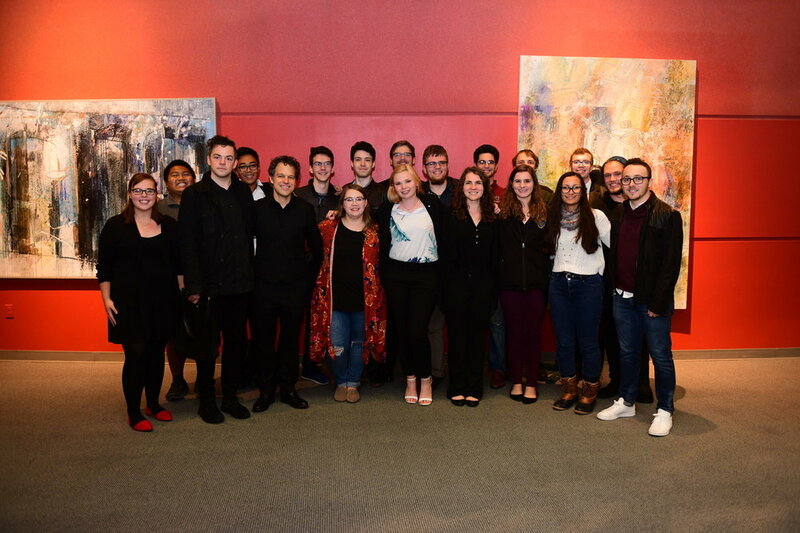 Coleman and Scott's wind quintet, Imani Winds -- probably the nation's leading woodwind quintet -- and the Grammy-winning Parker String Quartet have both been in residence, working directly with our students (Parker's residence is now a yearly one). The Southern Exposure New Music Series, a series I direct, curates groundbreaking performances of contemporary music and features some of the world's great ensembles and soloists (eighth blackbird, Brooklyn Rider, Matt Haimovitz, Alarm Will Sound, So Percussion, International Contemporary Ensemble, the Calder and JACK string quartets) as well as UofSC's outstanding students and faculty. Distinguished bassoonists who have visited campus recently and done masterclasses with the bassoon studio include Fabio Cury (Sao Paulo, Brazil), William Ludwig (Indiana University), Peter Kolkay (Vanderbilt University, Chamber Music Society of Lincoln Center), Lecolion Washington (University of Memphis, Prism), Brad Balliett (DeCoda, Marlboro Festival), and Christopher Weait (Toronto Symphony, The Ohio State University). One of the great things about bringing well-known artists into the Columbia and USC community is that the exchange is mutually beneficial. We learn a tremendous amount from these accomplished musicians and people; and our guests take away a new appreciation for our culturally vibrant city and university. After our Halloween concert "Thriller: A Halloween Spooktacular"
I'm lucky, as a performer, to be able to travel a lot and play in some really cool places. That's one of the best parts of being a musician, in my opinion: the opportunities it provides to travel and meet interesting people all over the world. However, to me, the work I do that's most important is right here in Columbia, South Carolina. This "local first" attitude, helping make one's own region a vital center of music-making, is something I want my students to take on as well, and one facet that makes bassoon study at USC special. 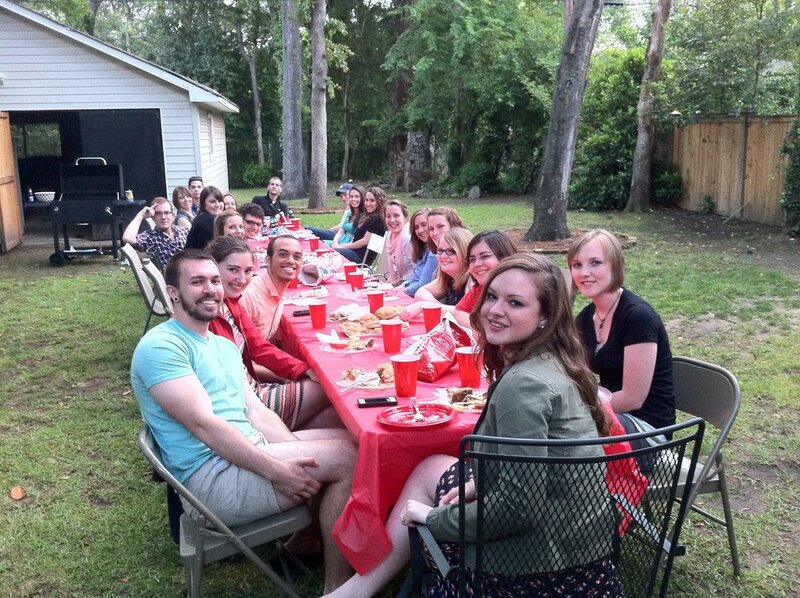 To that end, we prioritize community-centered projects and events each year. Double Reed Days and All-State Double Reed Workshops, alternating yearly, bring students to UofSC from throughout the state and region. 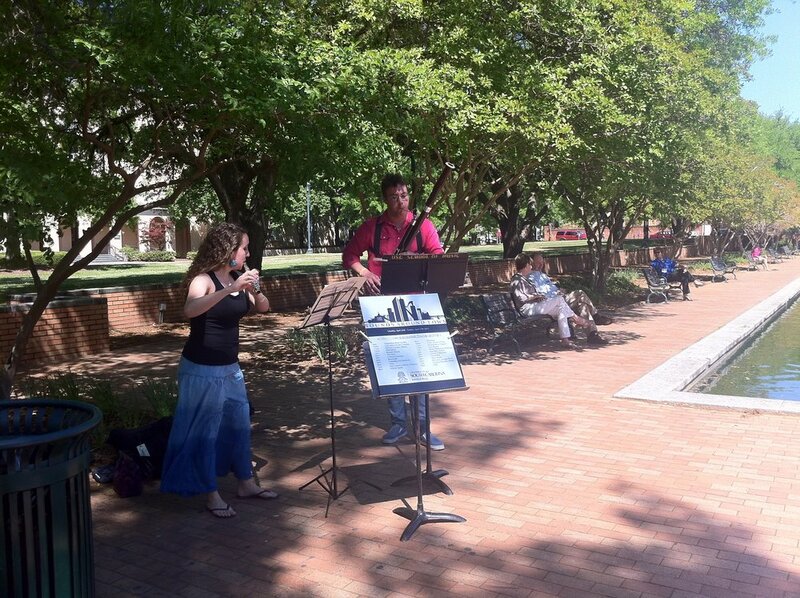 Events like Sounds Around Town take chamber music to the streets. The newly-formed Carolina Double Reed Collective, a UofSC student organization, applies for funding to support travel, guest artist visits, and other events. 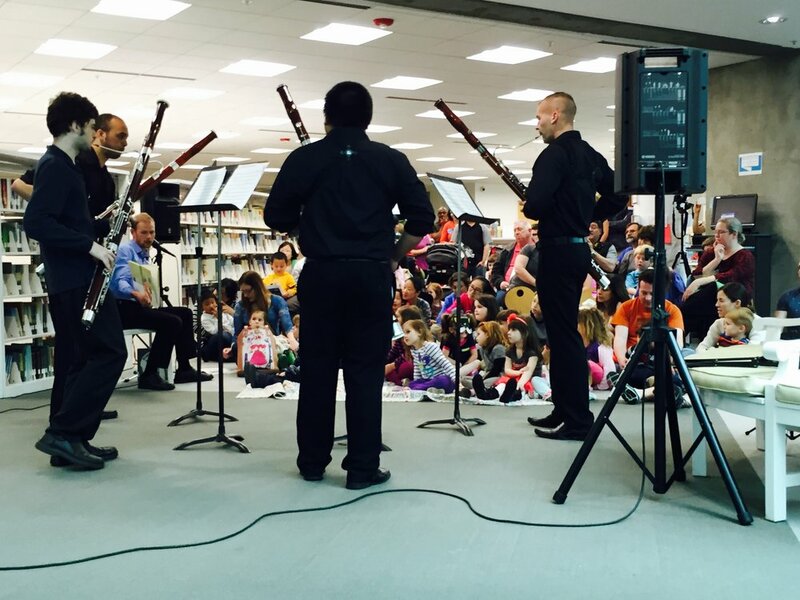 The bassoon studio's biggest recent project takes our students directly into the community: Bassoons in Schools provides free lessons to area students who would not ordinarily be able to afford them (and gives USC bassoonists valuable teaching experience!). 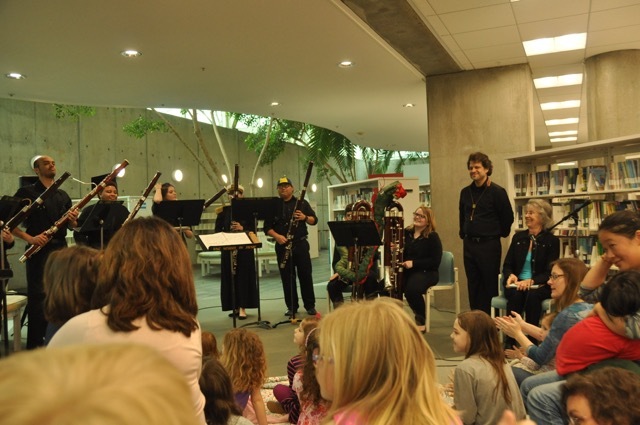 One of our favorite past projects involved commissioning and arranging new bassoon music to accompany readings of children's books at the Richland County Public Library. As a part of the concert we brought in a special guest artist and composer, bassoonist Christopher Weait, for a fully-costumed, staged performance of his theatrical piece "Ralph's Secret Weapon." To support all of this, we raised more than $1,000 in a GoFundMe campaign. The event was a lot of work, but we came together so much as a studio in the process -- and the delight on the kids' faces in the concert (and maybe the inspiration of some future bassoonists!) was worth every hour and penny spent. In addition to working in the Columbia community, we try to bring the community to us! It’s become a tradition to do a seasonal double reed concert each fall, focusing on either Halloween or Christmas, and a bassoon studio concert each spring. Fall shows have included “ugly sweater” Christmas shows (the sweaters are just about as important as the music, of course), and several "Halloween Spooktacular" concerts in which we all dress up as characters related to the music and introduce the works together. 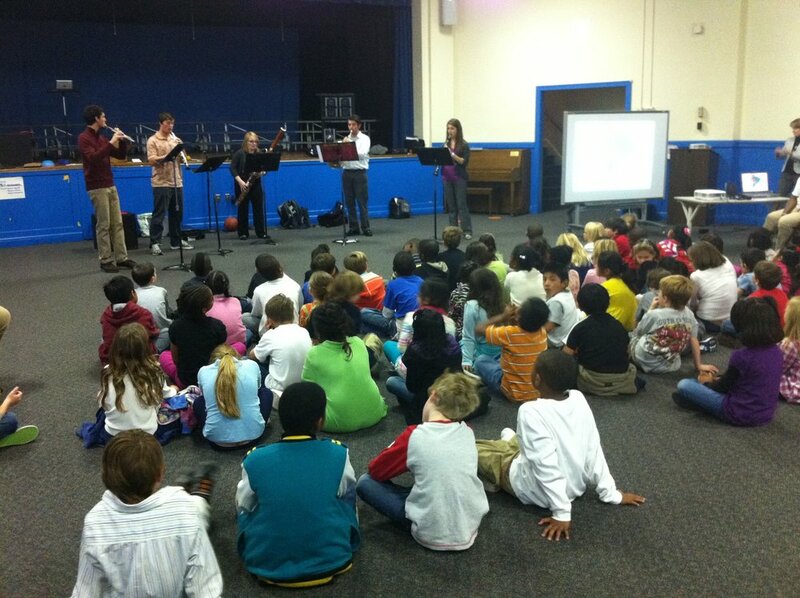 We’ve been able to fill the recital hall with both kids and adults! (Maybe they come mostly for the free candy, I'm not sure!). 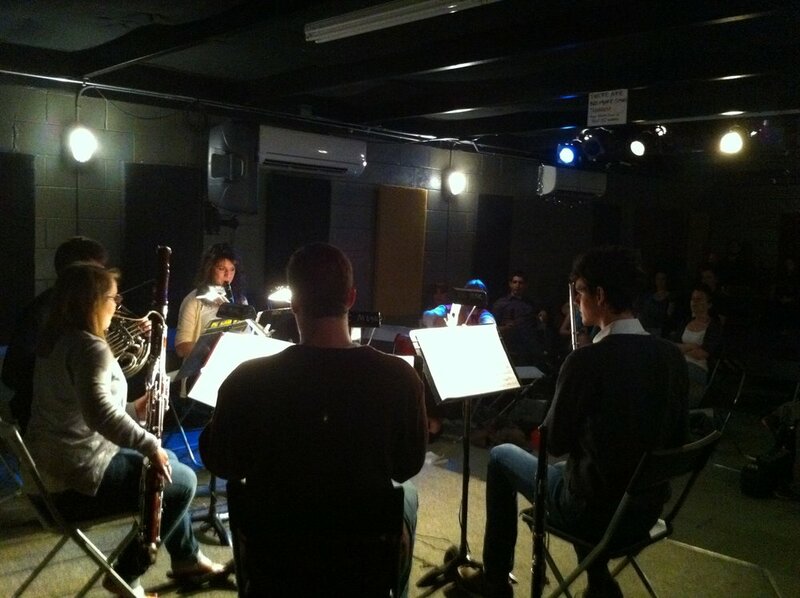 Whatever the project, UofSC bassoon students are at the forefront. Maybe you have an idea for a community-centered project we could take on! If so, don't hesitate to contact us. 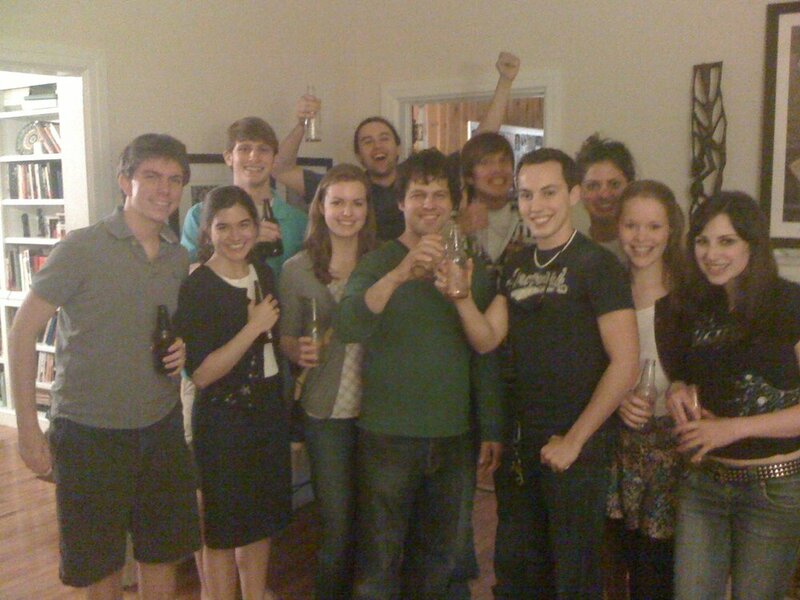 Enjoy some pics from USC double reed days, bassoon studio events, and such below (click to scroll through). Note: mobile devices must be oriented horizontally to see captions. Members of the studio with guest artist Fabio Cury, Feb. 2019. Bassoonist Trevor Bullock with his quintet at Columbia’s Soda City Market. At Richland Library, fall 2017. Growing up in Indiana, there's nothing much funnier than going to an ice rink in SC! Let me just say that for the first time in my life I felt like I was actually good at ice-skating. Working with USC's sophomore woodwind quintet. Taylor inspects early double reed instruments brought by the Charlotte-based Burns to Double Reed Day. Children's concert featuring "Ralph's Secret Weapon" by bassoonist / composer Chris Weait. (Apparently, in the bassoon studio). Playing John White's "Drinking and Hooting Machine"
The dulcian is a predecessor of the bassoon.